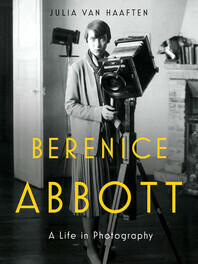 Berenice Abbott is to American photography as Georgia O’Keeffe is to painting or Willa Cather to letters. She was a photographer of astounding innovation and artistry, a pioneer in both her personal and professional life. Abbott’s sixty-year career established her not only as a master of American photography, but also as a teacher, writer, archivist, and inventor. Famously reticent in public, Abbott’s fascinating life has long remained a mystery—until now. In Berenice Abbott: A Life in Photography, author, archivist, and curator Julia Van Haaften brings this iconic public figure to life alongside outlandish, familiar characters from artist Man Ray to cybernetics founder Norbert Wiener. A teenage rebel from Ohio, Abbott escaped first to Greenwich Village and then to Paris—photographing, in Sylvia Beach’s words, "everyone who was anyone." As the Roaring Twenties ended, Abbott returned to New York, where she soon fell in love with art critic Elizabeth McCausland, with whom she would spend thirty years. In the 1930s, Abbott began her best-known work, Changing New York, in which she fearlessly documented the city’s metamorphosis. When warned by an older male supervisor that "nice girls" avoid the Bowery—then Manhattan’s skid row—Abbott shot back, "I’m not a nice girl. I’m a photographer…I go anywhere." This bold, feminist attitude would characterize all Abbott’s accomplishments, including imaging techniques she invented in her influential, space race–era science photography and her tenure as The New School’s first photography teacher. With more than ninety stunning photos, this sweeping, cinematic biography secures Berenice Abbott’s place in the histories of photography and modern art, while framing her incredible accomplishments as a female artist and entrepreneur.